'Huwwo' summarizes a character in one word! Daniel Asa Rose has a winner on his hands with LARRY'S KIDNEY'. He has the skill and the comic timing to pull off an unlikely caper story with lightness, hearty laughter, tenderness, and wisdom, creating a book that most likely will go directly to film. It is a fast summer read that is brimming over with some of the funniest conversations between the characters while keeping an eye focused on the very fast paced story that borders on a little miracle of writing. Strange, bizarre, out of the ordinary walk of life Larry is a victim of renal failure and needs a kidney transplant. 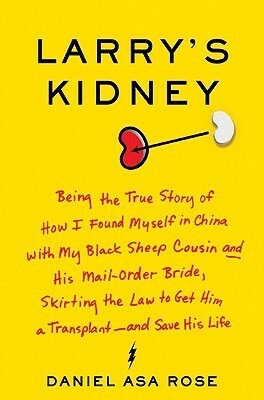 Living in the USA he is one of many potential recipients for a kidney transplant, a fact that stimulates the idea of traveling to China in an illegal attempt to find a new kidney. He enlists the help of his sturdy but estranged cousin Dan to accompany him to China and once there Larry introduces Dan to his email order bride Mary (a far cry from the young and beautiful description transmitted by the potential bride via email!). Larry and Dan (and Mary) unite in Larry's medical venture and the result is a story of hilarious incidents, moments of intrigue, a cultural awakening, and an exploration of the meaning of kinship and friendship and love spread among not only the trio but across the country of China. Sign into Goodreads to see if any of your friends have read Larry's Kidney.